Is Samsung right to flaunt its superiority over the iPhone 5? 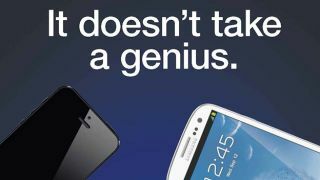 Samsung's long-running attempts to ridicule the iPhone and its fans have continued with a new print advert for the Galaxy S3 smartphone. The ad, which began running in newspapers on Sunday, claims that 'it doesn't take a genius' to choose between its flagship handset and the brand new iPhone 5, announced last week. Obviously the 'genius' jibe is in reference to the Apple Store employees, who smugly attempt to solve any problems with Apple machinery. Next, the advert goes on to list the respective spec list of the two devices, which, unsurprisingly, is depicted to work dramatically in favour of Samsung's own Galaxy S3 device. Beneath the comparisons, Samsung lists a whole host of features, like NFC, Smart Stay, Tilt to zoom, removable battery and loads more things that the iPhone 5 doesn't have. Do you think Samsung's latest ad is taking things a little too far? It is just sour grapes following last month's courtroom mauling or does Samsung have every right to flaunt what it considers to be vast superiority over the iPhone 5?